The 2017 season is now less than a month away. The league season starts on Saturday 22nd April but both teams have a bye week. Both the 1st and 2nd team get their season underway on Saturday 29th April vs Chapel, 1st Team at Home and 2nd Team Away. The 1st Round draw of the Bissenden Cup (1st Team) has been made and sees Charlesworth drawn at Home against High Lane, tie to be played on Sunday 7th May. We have both an Under 11s and Under 15s team for the coming season, the Under 11s first game is on Sunday 30th April at home vs Old Glossop. 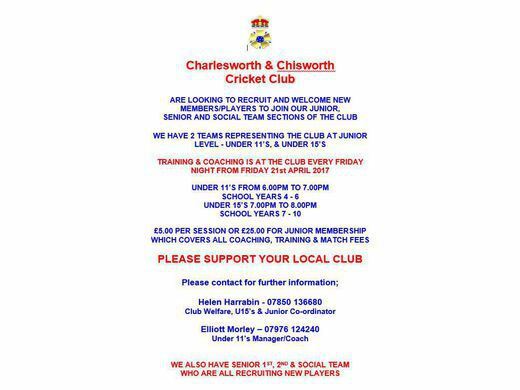 The Under 15s start on Monday 8th May away vs Broadbottom. Fixtures for both senior and junior teams are on the website. Saturday 1st April, 10am - Cricket Force Day - Workforce party to get the club/ground ready for the start of the season, please make every effort to attend. Saturday 8th April, 2pm - Grand National Day - Club get together, all welcome at the club from 2pm, full details here.